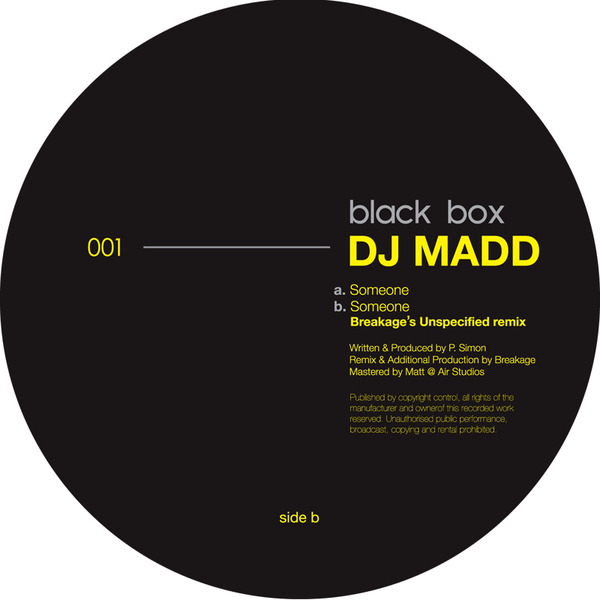 DJ Madd brings some heavy rollidge for the Black Box label, backed with a KILLER Breakage remix! Madd's original of 'Someone' sounds uncannily like F's heavy rollers style with tumbling steppers knitted together with deft delays and dub/garage bass, while Breakage steps up on the flipside to even-out the kinks and turn in a sparse but effective steppers mix with lurching subbass and sharpened percussion. For fans of F, Indigo or Headhunter, limited copies only.